Homemade Soft Pretzels have been on my list to make for a long time, and I finally had a legitimate reason to make them; meaning, a reason to make some and get them out of my house so I don't eat them all. While, these were a little time consuming, they were so worth it. In actuality, I found the whole process to be relatively relaxing. One thing to remember - time consuming does not always equal hard. These were not hard to make by any means... Relaxing, remember?! Of course, in cooking and baking, at the end of the day the most important thing is that it tastes good. These were fantastic. I can't wait to make some more again. 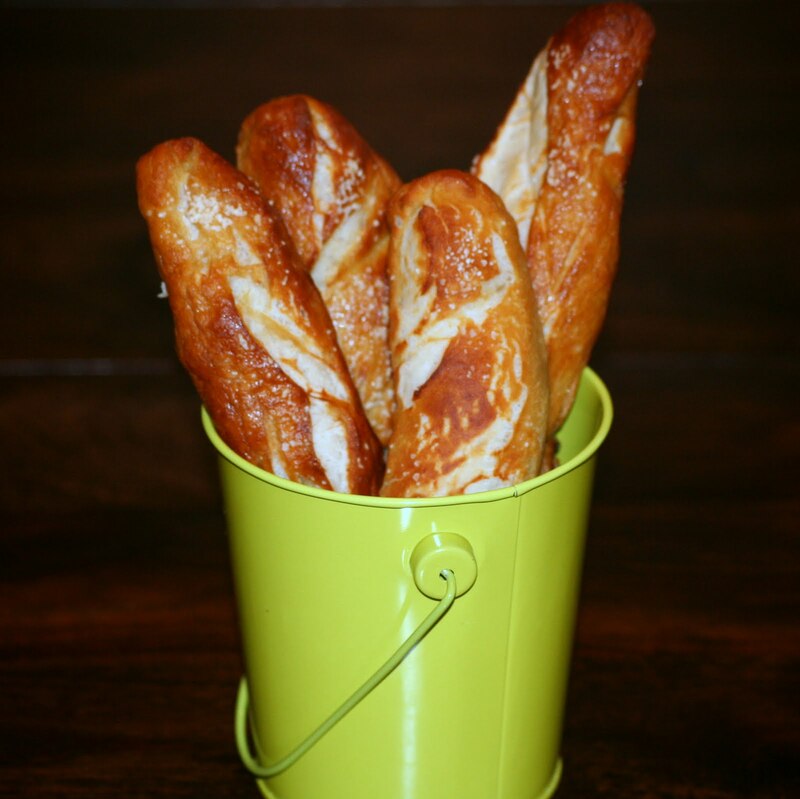 I chose not to shape in the more traditional twist shape, choosing to make pretzel sticks instead. 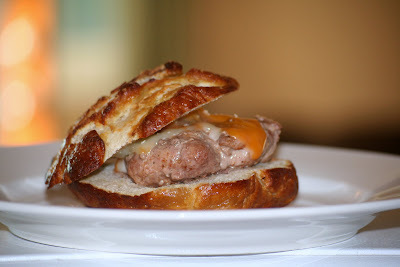 Additionally, I used some of the dough to make pretzel rolls/buns because I LOVE sandwiches on pretzel buns. Combine the water, sugar and Kosher salt in the bowl of a stand mixer and sprinkle the yeast on top. Allow to sit for 5 minutes or until the mixture begins to foam. Add the flour and butter and, using the dough hook attachment of your mixer, mix on low speed until well combined. Change to medium speed and knead until the dough is smooth and pulls away from the bowl, approximately 4 to 5 minutes. Remove the dough with the bowl, clean the bowl and then oil it well with the vegetable oil. Return the dough to the bowl, cover with plastic wrap and sit in a warm place for approximately 50 to 55 minutes or until the dough has doubled in size. Preheat the oven to 450 degree F. Line 2 half-sheet pans with parchment paper and lightly brush with the vegetable oil. Set aside. Bring the water and the baking soda to a rolling boil in an 8-qt. saucepan. In the meantime, turn the dough out onto a slightly oiled work surface and divide into 8 equal pieces. Roll out each piece of dough into a 24-inch rope. Make a U-Shape with the rope, holding the ends of the rope, cross them over each other and press onto the bottom of the U in order to form the shape of a pretzel. Place onto the parchment-lined sheet pan. Place the pretzels into the boiling water, 1 by 1, for 30 seconds. Remove them from the water using a large flat spatula. Return to the half sheet pan, brush the top of each pretzel with the beaten egg yolk and water mixture and sprinkle with pretzel salt. Bake until dark golden brown in color, approximately 12-14 minutes. Transfer to a cooling rack for at least 5 minutes before serving. - to make pretzel sticks: divide the dough into 8 equal pieces, and roll out each piece of of dough into a 24-inch rope and then cut in to 3 equal sticks. Disregarding the shaping part and continue to placing in the boiling water. - to make pretzel rolls/buns: divide the dough into 16 equal pieces and roll each section in to a ball. Continue to the boiling process.